The Robbers Cave experiment, a classic study of prejudice and conflict, has at least one hidden story. The well-known story emerged in the decades following the experiment as textbook writers adopted a particular retelling. With repetition people soon accepted this story as reality, forgetting it is just one version of events, one interpretation of a complex series of studies. In this experiment twenty-two 11 year-old boys were taken to a summer camp in Robbers Cave State Park, Oklahoma, little knowing they were the subjects of an experiment. Before the trip the boys were randomly divided into two groups. It's these two groups that formed the basis of Sherif's study of how prejudice and conflict build up between two groups of people (Sherif et al., 1961). A little name-calling wasn't enough, though. The experimenters wanted to increase the conflict substantially. To do this they pitted the groups against each other in a series of competitions. This ratcheted up the antagonism between the two groups, especially once all the team scores were added up and the Rattlers won the overall trophy for the competitive activities. They didn't let the Eagles forget it. The groups 'accidentally' came across more problems over the next few days. The key thing about each of them was that they involved superordinate goals: boys from both groups worked together to achieve something they all had an interest in. Finally all the boys decided to travel home together in the same bus. Peace had broken out all over. One of the reasons Sherif's study is so famous is that it appeared to show how groups could be reconciled, how peace could flourish. 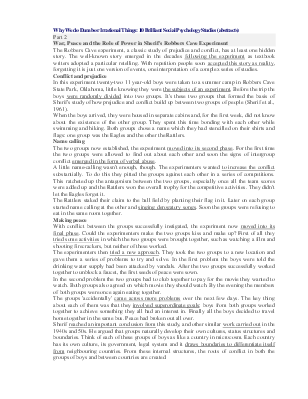 The key was the focus on superordinate goals, those stretching beyond the boundaries of the group itself. It seemed that this was what brought the Rattlers and the Eagles back together. Tasks to the text (Part 2). I. Read and translate the text paying attention to the underlined words and word combinations. 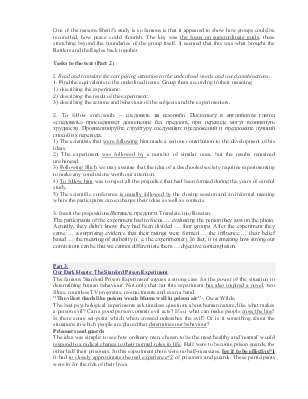 3) describing the actions and behaviour of the subjects and the experimenters. 2. To follow smb./smth. – следовать за кем-либо. Поскольку в английском глагол «следовать» присоединяет дополнение без предлога, при переводе могут возникнуть трудности. Проанализируйте структуру следующих предложений и предложите лучший способ их перевода. 1) The scientists that were following him made a serious contribution to the development of his ideas. 2) The experiment was followed by a number of similar ones, but the results remained unchanged. 3) Following Illich we may assume that the idea of a deschooled society requires experimenting to make any conclusions worth our attention. 4) To follow him was to reject all the prejudice that had been formed during the years of careful study. 5) The scientific conference is usually followed by the closing session and an informal meeting where the participants can exchange their ideas as well as contacts. 3. Insert the prepositions/Вставьте предлоги. Translate into Russian.